What's the Best Way to Treat the Flu? What’s the Best Way to Treat the Flu? Every year, the influenza virus sickens hundreds of thousands of Americans and causes tens of thousands of deaths. In the United States, the virus is most prevalent from fall to early spring. Unlike many other viruses, the various influenza viruses are constantly mutating, which means that there is no 100 percent effective flu treatment or flu cure. Your best chance for avoiding the flu this season is to get the annual flu vaccine and to practice preventative measures, such as frequent hand washing and disinfecting commonly used items and surfaces. If you should become sick, there are flu relief steps that you can take to make yourself more comfortable. Although there is currently no flu cure, there are treatments available that may help shorten the duration and severity of your symptoms. Prompt treatment may also lessen the possibility of complications in vulnerable individuals, such as the young, the elderly, and those with chronic respiratory conditions. The most commonly used flu treatment is the oral antiviral medication oseltamivir, which is sold under the brand name Tamiflu. Zanamivir, sold under the brand name Relenza, is an inhaled antiviral medication that may be used for flu relief in individuals who do not suffer from chronic respiratory issues. It is important to note that antiviral medications are only effective for flu treatment if started within 48 hours of the onset of symptoms. If you are exposed to a known case of the flu and have a health condition that puts you at high risk for complications, you may want to talk to your doctor about taking an antiviral medication prophylactically before you develop symptoms to reduce your risk of becoming ill or suffering complications. Self-help measures may not be a flu cure, but they may help alleviate some of the worst symptoms and make you more comfortable while you recover. The fever associated with the flu can cause you to become dehydrated and exacerbate your fatigue and headache. Warm soup or broth, water, juices, or sports drinks containing electrolytes are all good choices for increasing your fluid intake. Avoid the temptation to “push through” the fatigue. Sleep as much as possible since this will help boost your immune system so that it can fight the virus. Use over-the-counter pain relievers, such as ibuprofen or acetaminophen, to relieve your fever, headache, and muscle aches. 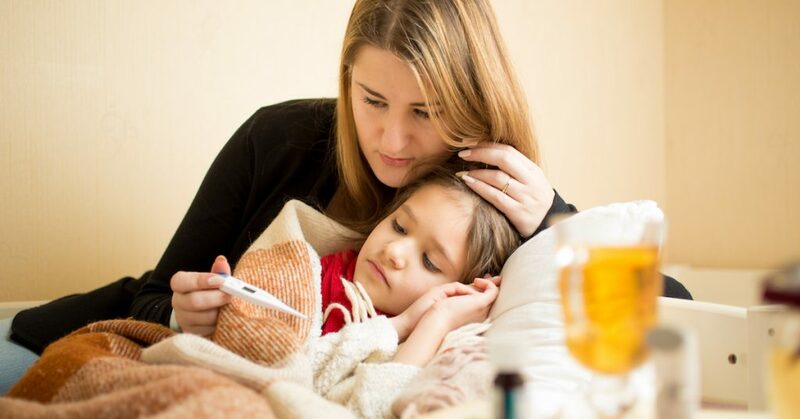 Aspirin should never be given to children or teens with viral infections and fever since it may lead to a rare but fatal condition known as Reye’s syndrome. Stay home until you have been free of fever for at least 24 hours. This will help prevent the spread of the virus to others. Unlike other vaccines that provide years of protection, the flu vaccine must be renewed every year. One reason this is necessary is that the protection offered by the vaccine naturally decreases over time. Secondly, each year’s vaccine is modified to take into account the strains of the virus that are most likely to be prevalent during that flu season. It is impossible to get the flu from the flu vaccine. The viruses used in the vaccine have been weakened so that they cannot produce illness. It is possible to experience a low-grade fever, minor muscle aches, or other minor side effects from the vaccine, but these are different and less severe than the flu. It takes approximately two weeks for your body to build up antibodies in response to the vaccine, so the sooner you are vaccinated, the sooner you will be protected. It is still possible to get the flu even if you get the vaccine; however, it will likely be less severe. Getting the flu vaccine during pregnancy may help provide protection for the baby after birth since the mother passes along antibodies to the baby. Getting vaccinated is an important way to protect those around you who may be vulnerable to flu-related complications. If you or a loved one develops flu-like symptoms, we urge you to visit one of our FastMed Urgent Care locations as soon as possible. A FastMed provider will discuss your symptoms and health history to determine the most appropriate treatment. Our helpful staff and providers are also available to answer any questions you may have about how to treat the flu or how to get rid of the flu. We offer convenient locations throughout Arizona, Texas, and North Carolina with extended hours to serve you and your family.